Our membership is primarily from the Northumbria area and members meet regularly across the region in local self-help groups which also run their own occasional advanced workshops. The group's core activity, promotion of basketry in Northumbria, is carried out through courses, workshops and activities for beginners. These include tuition in willow basket making, rush and cane seating, willow sculpture, construction of willow hurdles, screens and plant support pyramids, and Christmas decorations. Our members also manage willow plots at Whittondean near Rothbury and Whitley Chapel to the south of Hexham where we grow willow for basket weaving and use in living structures not only by our members but also for sale to the public. Members attend local events to demonstrate basketmaking and associated crafts and promote the Group. 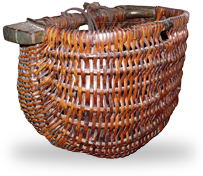 We also conduct research into the history of basketmaking and of baskets specific to our region. The group has produced a book written by Liz Balfour ‘The Fishing Baskets of Northumbria’ which is available for sale at £4.50 per copy. Contact info@northumbriabasketrygroup.co.uk. For information about the wider activities of the group see the Join Us and Gallery pages.